Toronto, ON 2008. Accompanying Jack to train station for one of his solo trips in Quebec. 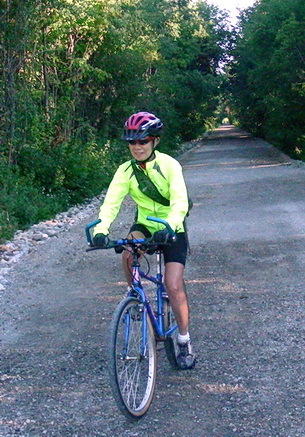 Cycling on new CP rail converted bike path by Edwards Gardens. Toronto, ON 2011. N.B. 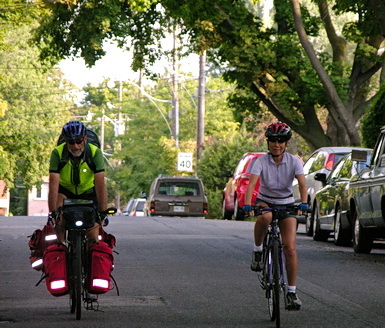 : My thanks to Barb, another cycling ethusiast in Washington state, where I first saw this proverb. Her blog offers a wonderful list of blogs written by women cyclists worldwide. Okay – that was AWESOME! Wisdom and wit – a lovely combination! Love, love, LOVE your challenge! I’m off to Disney World this week and then – with luck – I’ll be heading to England soon for a quick trip. As soon as I get back, I do believe I am going to cook something entirely new! Thank you! What GREAT fun! That is great! There are times to ride your bike, just for the sake of it! Love those days! Don’t know about you Anita, but sometimes my body becomes so accustomed to cycling daily that I get impatient walking for half an hr. to a store. I’ve been known to just cycle 3 blocks or less because it just feels better to me to bike to the neighbourhood destination. Glad you enjoyed the proverb! All your posts are so engaging and this one caught me by surprise. I can’t wait to see what you publish next. Ride on! 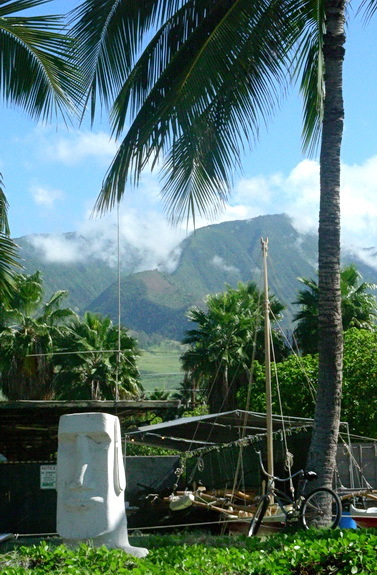 An upcoming post will be about an area you might be familiar with. Might take a few wks. before it gets published. Appreciate you dropping by! Don’t know if the original “author” did it, but I like the succinct meanings in the proverb since it nicely tells very simply to non-cyclists why cycling is a good thing. Man, that’s an even better one than the proverb I used in my New Years resolution post about living in the moment. I may swipe that at some point because it’s so true. There are so many reasons to ride a bike and they’re all wrapped up together in beautiful synchronicity. That proverb just rings right for any cyclist by saying it so simply about all the right reasons for cycling. The proverb has been floating around in the cycling world for past few years but I only recently came upon it! Maybe you’ll let me be your student. Lovely. It’s a very popular aphorism on cycling. Ah, might be awhile before I get back on bike: I had a head injury after another cyclist crashed into me at the beginning of 2015, jbw. Oh no! Get well soon!! !